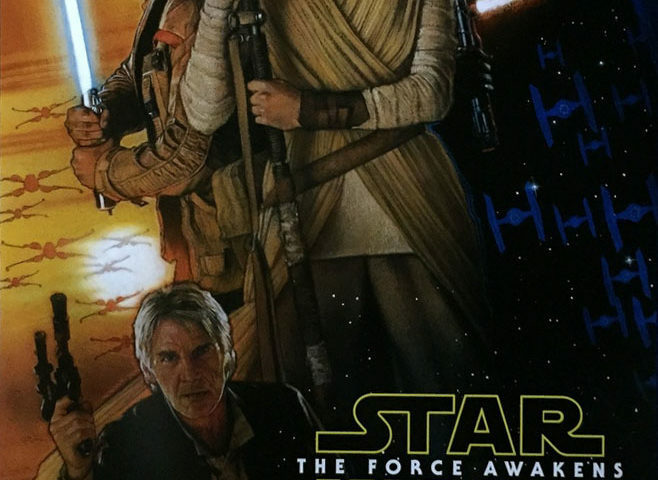 By now you’ve probably heard that renowned movie poster artist Drew Struzan has returned to the Star Wars universe. After all, one of the biggest stories to come out of the D23 Expo was the commemorative poster Struzan did for Star Wars Episode VII: The Force Awakens! …And we were talking along and he just goes ‘…Well, would you?’ and I said ‘…If I was asked.’ And that was the conversation (laughs). By the end of it, there were no other words. So about a year later, we get together and meet and he says we’re using all the original people – John Williams, Kasdan, Harrison Ford’s in it, everybody’s in it and everybody’s writing and making the music and we have to have your art to make it the real thing. So, of course, I’ve got to do it for George and I’ve got to do it for Star Wars. I’ve never worked with J.J before and so we started working on it and he showed me like half the movie and it was just… a wonderful film and I know it’s going to be grand. I got to read the script and subsequently I’ve seen half of it and I can tell you and the fans this, Honest to [G]od, it is far and away probably going to be THE BEST Star Wars you’ve ever seen. Well it’s beautifully made and it’s a wonderful story. Well, that’s high praise indeed! Of course, the rest of us will find out for ourselves in December. It’s not long, now! Next article Star Wars Rebels Season Two Preview at New York Comic Con! Oh. My. Gosh. This is so amazing to hear. The praise he gave TFA means a lot coming from him too! Thanks for posting the interview!